We began our work on Ci Yin An (慈荫庵) – Sheltered Mercy Nunnery, (the Pear Orchard Temple) in thanks for the birth of our daughter. 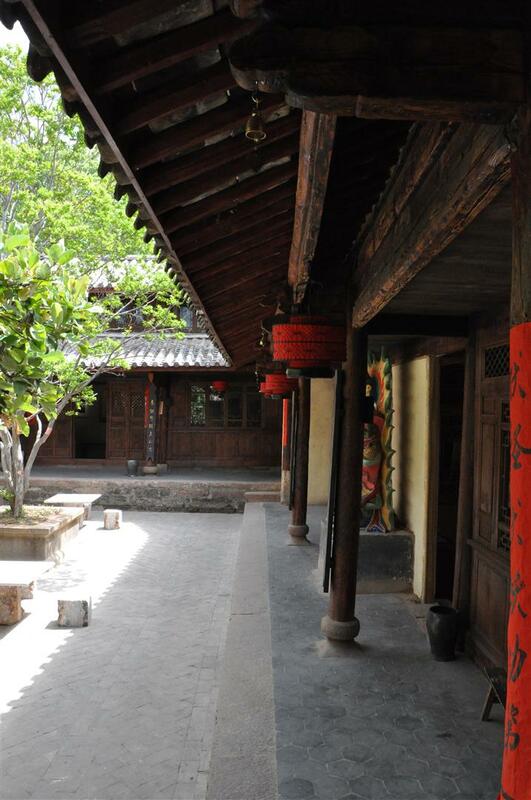 As we planned our work, we realized that the Elders of Diantou Village had stories about the temple which were the only records of what the ancient Shaxi temple used to look like and how it functioned. We talked to these people in the village in order to get a clearer picture whether or not we would bring back some of these practices or features in our Shaxi temple design, and how to balance them with modern considerations, our budget and the overall aesthetic of the place. One of the Elders told us that the temple served as a village clock and warning centre. These functions were carried out by the gatekeeper who stayed in the temple who would strike a large bronze bell. In case of a fire or a thief in the village, the bell would sound. To mark the beginning of temple ceremonies and the end of the working day, the bell would also be rung. 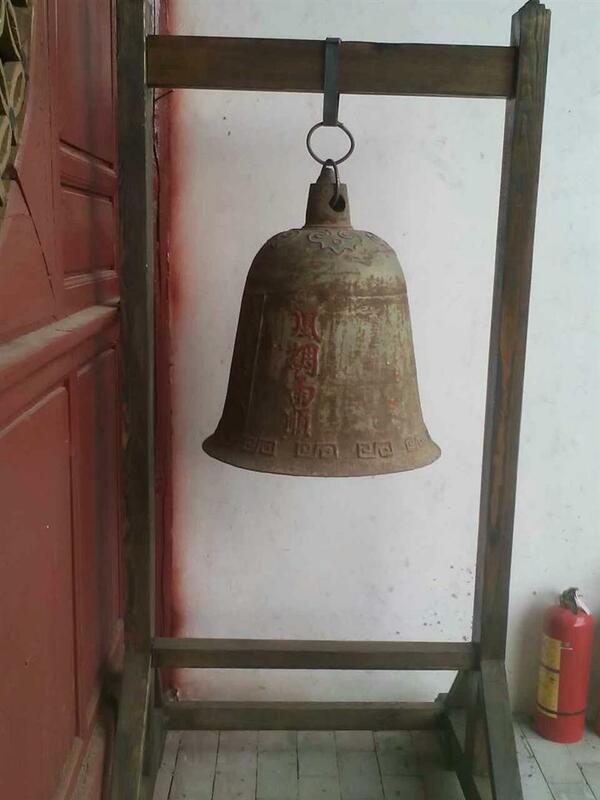 According to the Elders, the Ci Yin An temple bell was taken away by Red Guards during the “Smash the Four Olds” 破四旧 campaign at the end of 1966, when such things were considered superstitious and anti-Proletarian. The was the same time when the two resident nuns were driven out and their dormitories destroyed. The bell was one of many aspects of our Shaxi temple design plan that we did not include in our original budget but as we worked, looked for one that might be suitable as a replacement. One day last Summer while in Guilin, I was rummaging through an antique stall in the Bird and Flower Market and under some dusty lattice windows spotted what looked to be a bronze bell. As I cleared away the jumble of wooden frames, I saw that this was a temple bell with the two typical inscriptions, one on each side: 国泰平安， 风调雨顺 (The country flourishes and the people live in peace, Winds are favorable and the rains are timely). The shop keeper told me it dated from the late Qing Dynasty, was made somewhere in the North. He didn’t have many customers looking for such a huge bell (it weighed over 200 pounds) but when I told him it was for a temple in Yunnan whose bell had been lost, he gave me a favorable price of 4,000 yuan, including crating and shipping to Shaxi. I decided it was worth the price and had him prepare it to ship. Once at the temple, we needed to re-create the sizable wooden frame from which to suspend the bell and put it back outside the corner of the main hall where the bell had once hung. With help from our master carpenter and project leader, Mr. Yang, the frame was built and the bell restored to its rightful place. Since the temple bells don’t have clappers, we got a section of wooden fence post which was wrapped in red cloth to sound the bell. Apart from this large bell, we learned that there were chimes 风铃 under the corners of the pagoda roof, which were thought to keep away bad spirits and prevent birds from nesting under the eaves. We replaced these small bells at the end of our structural work as we began the decoration phase, using small bronze chimes that we found in a distant temple supply shop. Lanterns and their placement were also a subject of discussion. For the local people, red lanterns are auspicious, festive and more lanterns = better. However, this is not traditionally the case with nunneries, and lanterns were typically lit and hung only in halls of worship and during certain festivals held at the temple. The other issue was that since there was only one electric line in the whole temple which ran from the street to the legacy kitchen and main gate, we would have to re-wire the temple to accommodate comprehensive lighting anyway and fire safety rules would not allow for open flame lighting. We compromised by removing lanterns from the main entrance, relocating the electrical panel away from this area and putting up eight compact size traditional lanterns around the temple’s interior walkways which can be lit for ceremonies. 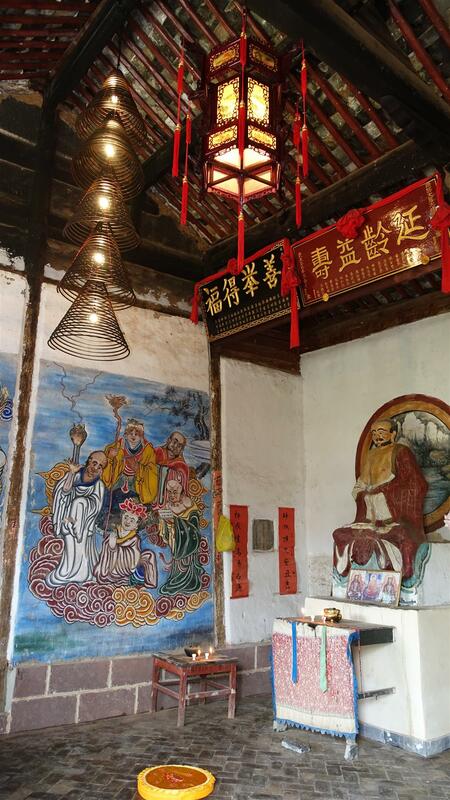 We purchased two typical painted glass and wood temple hall lanterns about 40 x 60cm in size and hung them from the main ridge beam above Guan Yin in the main hall. 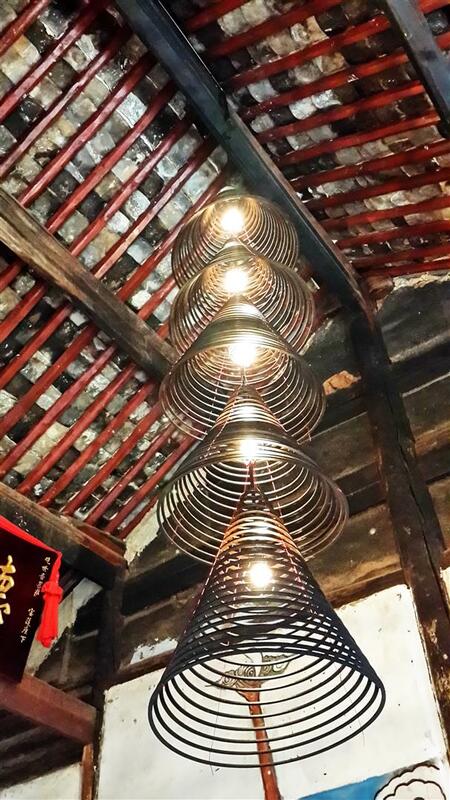 Since the hall remained very dark, I designed two sets of hanging lamps that resemble the nesting incense coils of Southern Chinese Buddhist temples. When seeking consultation on designing the main courtyard, one of the Elder women mentioned that there was a large urn, which she says was filled with water in case of fire during the dry season. Since we had installed a pressurized water system with a large auxiliary tank and cistern, we didn’t feel the urn was warranted for fire suppression, but we wanted to do our best to replace what had been lost. 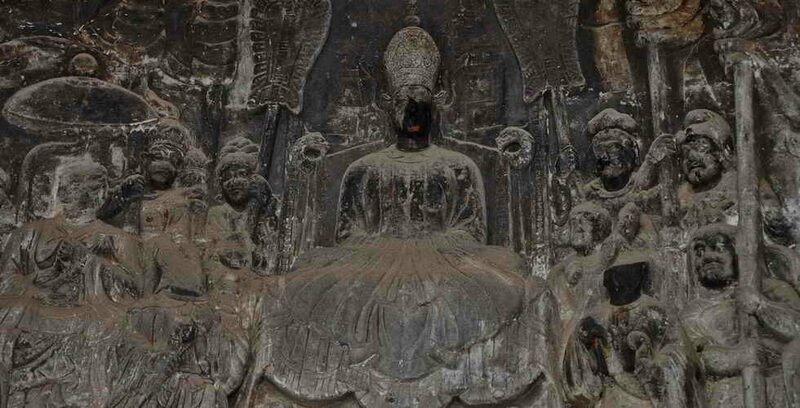 We began looking in the nearby town of Dian Nan 甸南, famous for stone memorials and decorative stone animals for buildings. 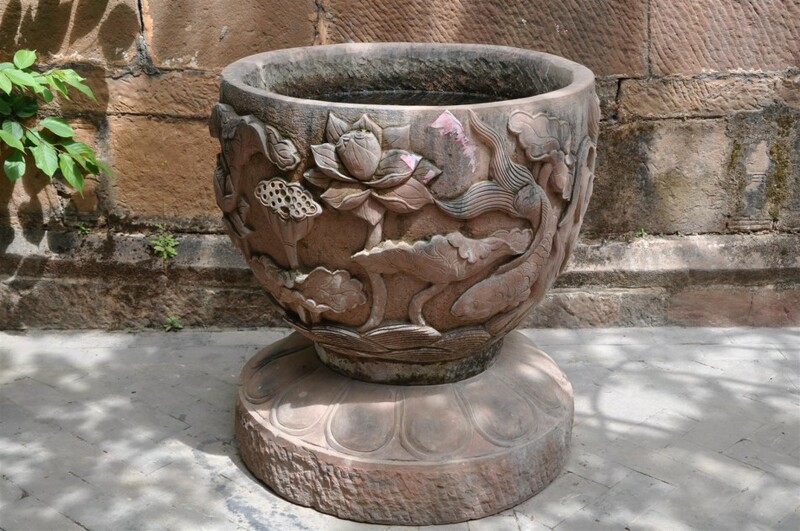 We found that we could commission a stone urn with temple specific carvings for around 6,000 yuan. 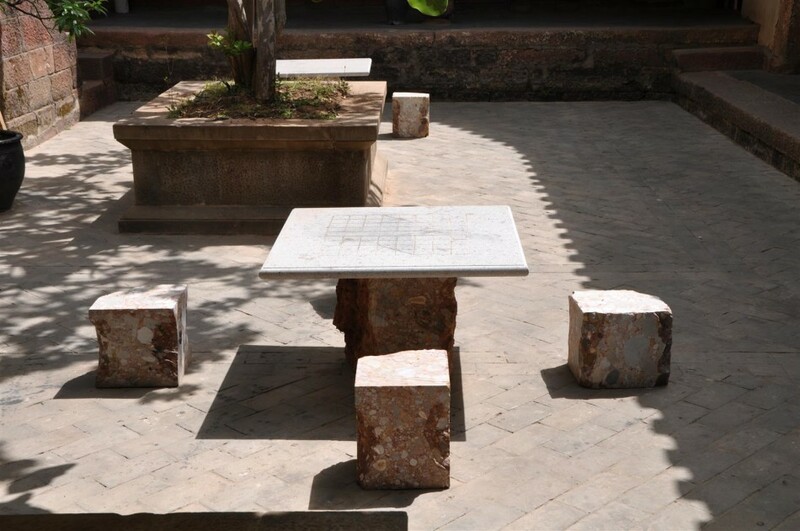 Since it was outside of our budget, we waited until late last year to make and install it in the main courtyard, along with two sets of stone tables for people to play chess.